I’m at the entrance to Calypso Cave on the island of Gozo and can just about see Sicily only 60 miles away. It’s claimed that Odysseus was kept here as a prisoner of love for 7 years by the nymph Calypso until he appealed to Zeus and was set free. He would have had a fantastic view of Ramla Bay, just below, which is the best beach on the island. It’s a smear of orange sand fringed by the turquoise waters of the Mediterranean and in early March is completely deserted. Gozo is just 5km from Malta and the fact that there’s no airport, only ferry access, means it’s not as developed as its larger sister. At less than 9 miles long and 5 miles wide, cycling or hiking, is the perfect way to get around and I’m doing a bit of both. I’ve been staying at the Ta’ Cenc Hotel, who’ve provided my bike, but I’m on my way to the Kempinski Hotel which has one the best spas in Europe. Although the cycling is fairly leisurely, I know I’ll need to soothe my aching limbs at the end of the day. The route takes me down to the compact harbour at Marsalforn, a pleasant place for lunch, then along the coast, past a patchwork of salt pans. When the tide recedes, the water evaporates leaving deposits of salt, and for centuries, this was one of the only sources of income for the locals. Some of them still do it today, although tourism is now the largest employer. There’s been a lot of haphazard development here, fortunately all low rise, and most is built in local golden limestone so it blends harmoniously into the landscape. This attractive stone is seen at its best in the geological landmarks at Dwejra Bay where wind and sea have conspired to create natural sculptures. Guarding the mouth is Fungus Rock, 65m high and named after the medicinal plant that grows there. 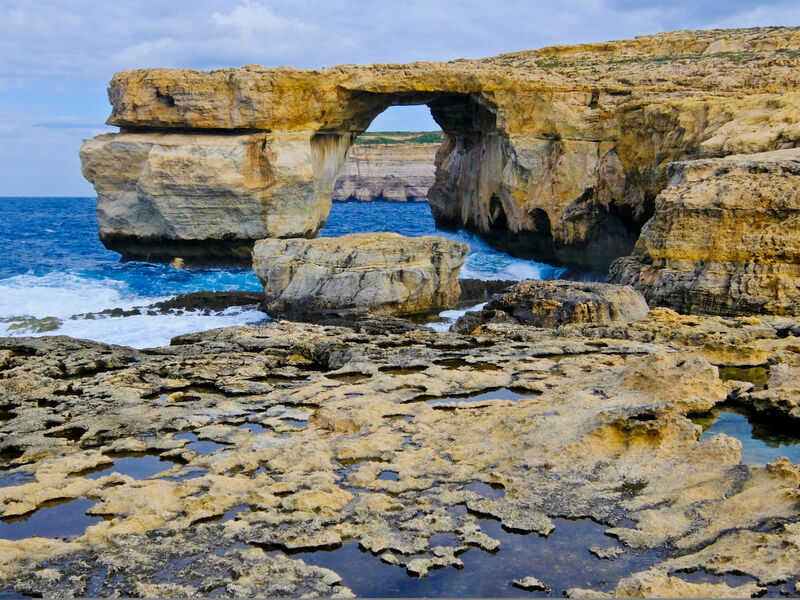 A natural arch, the Azure Window, juts out into the sea and, on a good day, frames the sunset. There’s also the Inland Sea, which was once a huge cave until the roof collapsed. Its crystal clear waters form a blue lagoon and it’s linked by a small tunnel to the bay beyond. Next day I’m hiking, climbing out of Mgarr port past the sprawling Fort Chambray, to a 17th watchtower, one of many, erected by the Knights of St. John to spot marauding pirates. There’s a good view of the island of Comino here, the smallest in the Maltese Group and the wind is whipping up the waves. In this weather, the towering Ta’ Seguna cliffs look particularly impressive and as I walk at their edge, I’m intrigued by small stone built huts. They can’t all be toilets but my guide tells me they are hides, built by locals to trap birds, now an illegal activity. The islands have had a number of owners over the years, a fact reflected in the language which is derived from Sicilian Arabic. It uses Latin characters, perhaps because it was only written down in the 15th century and is the only Semitic language to do so. As a result, spellings are delightful quaint and place names verge on the unpronounceable. Mercifully everyone speaks English, since it was a British colony until independence in 1967, and many of the shop signs bring back memories of England in the 50’s. It’s worth visiting the Ggantija Temples, apparently the oldest freestanding structures in the world, predating Stonehenge and the Egyptian pyramids. There’s an excellent museum here and the complex consists of 2 Neolithic structures dating from around 3,500BC The name derives from the word ġgant, meaning giant in Maltese, as the locals presumed only they could have built them. In fact it was probably early immigrants from Sicily who practised fertility cults here. The island’s capital, Victoria, was renamed in 1887 in honour of the British queen, but is still known locally as Rabat. 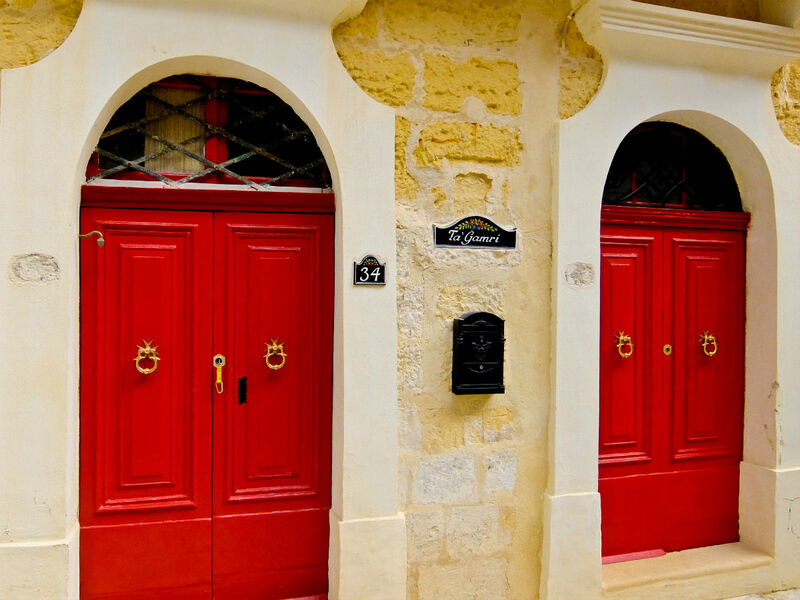 It’s a bustling place, undergoing much renovation, but it’s worth exploring the narrow winding streets where the residents still leave keys in their front doors. At the top of the town is the Citadel, designed to shelter the population when pirates were sighted. These days it houses a folklore museum but is still home to Gbejniet, a local speciality cheese. Rikardu, owner of the Ta’ Rikardu wine bar, makes this fresh every day from unpasteurised sheep or goat’s milk and is happy to demonstrate. Even better he serves it at his table with crispy bread called Hobz. 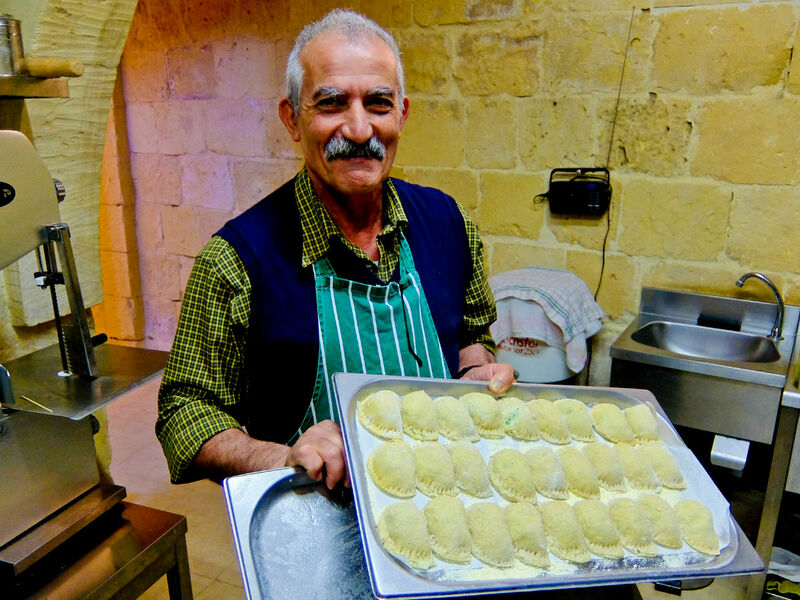 Best of all is his home made ravioli, stuffed with soft cheese and topped with delicious tomato sauce. 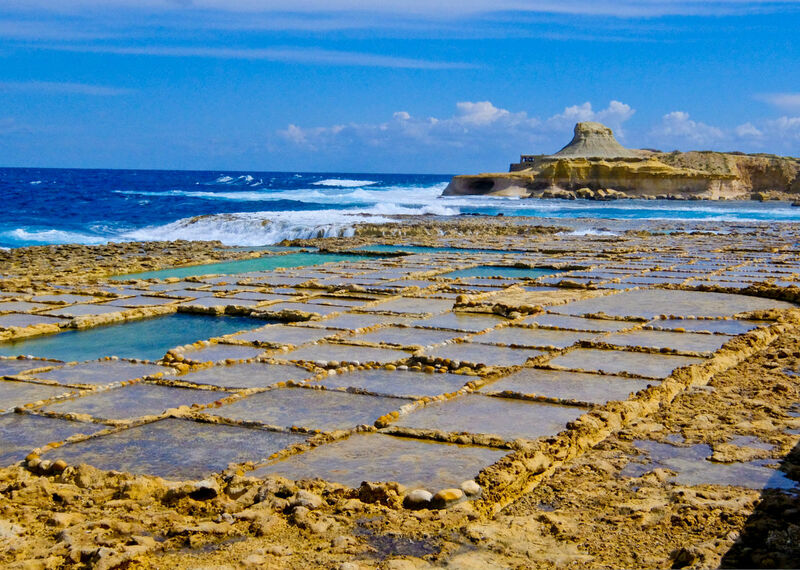 Although Gozo is just a 25 minute ferry ride from Malta, it’s like entering another world, particularly as the inhabitants are known as Gozitans, something straight out of Star Trek. Activities like diving, hiking, cycling and surfing are all on offer, perfect for spring and autumn. In the height of summer, though, you might just want to take things easy and lounge on the beach at Ramla and who could blame you? After all, Odysseus got stuck here for 7 years but then he was a prisoner of love. Air Malta flies direct to Malta from London Heathrow. Visit Malta has information about the islands. Headwater’s Gozo Activities holiday combines some of the finest walking and cycling routes around the island, staying at two 5 star hotels. Prices start at £1239 per person, inc flights from London Heathrow with Air Malta, return ferry and all transfers. To book call 0160 682 8527. The Ta’ Cenc Hotel is a 5* base for hiking and cycling. The Kempinski San Lawrenz is also 5* and has one of the best spas in Europe. Zafiro Restaurant, in Xlendi, serves good local food.